Approximately 90% of spine fractures occur in the thoracic and lumbar spine, with the majority of these occurring in the thoracolumbar junction between T11 and L2., Burst fractures, in particular, encompass nearly 50% of all thoracolumbar trauma. While many of these can be treated nonoperatively, the surgery is indicated in cases of neurologic deficit or when there is potential or observed instability. The creation of thoracolumbar injury classification and severity score has provided a valuable tool for help in surgical decision-making regarding which patients require surgery. However, even after the decision for surgery is made, significant debate remains on the appropriate surgical approach. Conventionally, an anterior approach was preferred for decompression and stabilization, but with improved stability through modern pedicle screw constructs, all posterior approaches have gained acceptance as an alternative. In this review, we will discuss the data for and against an anterior approach/anterior reconstruction for thoracolumbar burst fractures with respect to biomechanical considerations, canal decompression, and neurologic function, as well as perioperative complications and patient outcomes. We performed a literature review using PubMed. 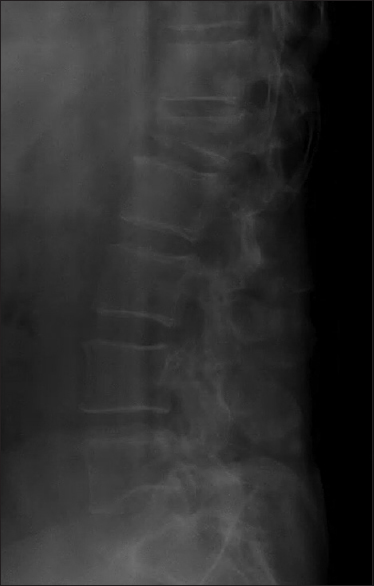 Terms included in the search were “thoracolumbar burst fracture,” “thoracolumbar burst fracture anterior,” “thoracolumbar burst fracture posterior,” “thoracolumbar burst fracture anterior versus posterior,” “short-segment fixation,” and “long-segment fixation.” From the articles found, the titles were first reviewed for relevance. Abstracts of the relevant titles were then read for inclusion in the paper. Additional articles were also then secondarily obtained using references from the included articles. About 40 articles were included in the final list, two of which represent systematic reviews of the literature. The majority of axial forces through the thoracolumbar spine occur through the vertebral bodies and discs. When anterior column support is compromised from a burst fracture, increased tensile forces are placed on any posterior hardware. Several studies have demonstrated high-failure rates when the posterior fixation is not augmented with an anterior reconstruction.,,, McLain examined 52 patients with thoracolumbar injuries, 19 of which underwent short-segment posterior fixation. He noted a high rate of construct failure, most often characterized by screw bending, especially when anterior column instability was present. Similarly, Carl et al. 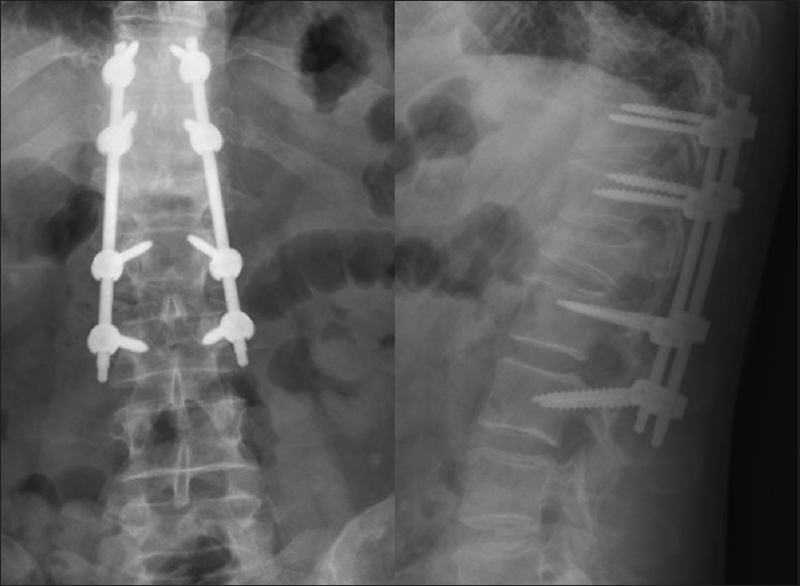 analyzed 38 patients who underwent pedicle screw instrumentation for thoracolumbar burst fractures and dislocations and found that nine patients (24%) sustained either bent or broken screws. Biomechanical studies corroborate the superiority of circumferential fixation. In a classic study, McCormack retrospectively examined 28 patients who underwent short-segment posterior fixation for both columns spinal injuries to create a point system to help predict screw breakage and select patients for anterior reconstruction. In their analysis, patients with significant comminution, little bone fragment apposition, and increased kyphosis correction should be supplemented with anterior column support. Parker et al. employed the load-sharing classification in their treatment of thoracolumbar fractures. About 23 patients with burst or Chance fractures had point totals <7, and all underwent short-segment posterior instrumentation. There were no cases of implant failure, mean kyphosis correction was 12°, and loss of correction was only 4° at final follow-up. While this and the previously mentioned studies, all include early-generation pedicle screw instrumentation – and thus its application to modern constructs is questionable – it does still provide a useful guide for when short-segment posterior instrumentation may be inadequate alone. Sagittal alignment does appear to be improved with anterior column reconstruction. Been performed a retrospective review of 46 patients who sustained thoracolumbar burst fractures treated with either anterior-posterior stabilization or posterior only distraction and stabilization. Loss of reduction >5° and instrumentation failure was significantly higher in the all posterior groups. Sasso et al. compared patients undergoing anterior only reconstruction and short-segment posterior instrumentation. While there were no hardware failures in either group, the posterior group had an average loss of 8.1° of sagittal plane correction compared to only 1.8° in the anterior group. Similarly, Hitchon et al. retrospectively analyzed patients who had undergone either anterolateral or posterior approaches for thoracolumbar burst fractures. The preoperative sagittal deformity measured 11.9° in the anterolateral group compared to only 4.1° in the posterior group; yet, postoperative deformity had been corrected to 2.0° in the anterior group versus 4.0° in the posterior group demonstrating a much better improvement in sagittal alignment when an anterior approach is employed. The short-segment posterior fixation may also be augmented by adding screws into the affected level. Mahar et al. performed a cadaveric-biomechanical study in simulated L2 burst fractures in which they compared specimens with segmental fixation (L1 through L3) and nonsegmental fixation (L1 and L3 only). They found that construct stiffness was higher in axial torsion in the segmental group. Clinical studies have supported the biomechanic superiority of adding fracture-level screws. Guven et al. randomized 72 patients to receive short-segment or long-segment posterior fixation and then further divided them into potentially receive a screw in the fractured level. They found that inserting screws into the fractured level improved the maintenance of intraoperative correction of kyphosis. Similarly, Farrokhi et al. randomized 80 patients to receive short-segment posterior fixation with or without fracture-level screws. Those who had screws at the level of the fracture demonstrated 6% improvement in kyphosis whereas those who had the affected level skipped worsened by 29%. Thus, when considering short-segment posterior fixation, surgeons should strongly consider the use of fracture-level screws to improve stability and correction of kyphosis. It is important to note that for those considering short-segment posterior fixation, there are times when anterior reconstruction and instrumentation cannot be employed. Kaneda et al. noted high rates of pseudarthrosis associated with low lumbar fractures especially L4. The location and shape of L5 made instrumentation more difficult, and they stopped using the Kaneda device in 1985. In addition, in cases of high thoracic or low lumbar fractures, the location of the great vessels precludes safe hardware placement. As such, those considering an anterior approach for decompression and stabilization should limit their levels to the mid and lower thoracic spine as well as the upper lumbar spine. Alternatively, all posterior approaches with transpedicular or costotransversectomy can permit anterior vertebral body reconstruction while avoiding the need for a separate surgical approach or placement of hardware anterior or lateral to the vertebral body. Long-segment posterior fixation – fixation two levels above and two levels below the fracture – may avoid the biomechanical and sagittal profile shortcomings associated with short-segment fixation constructs and thus may obviate the need for any anterior column support. Tezeren and Kuru randomized 18 neurologically intact patients with burst fractures to long-segment or short-segment posterior fixation. Five of nine patients (55%) demonstrated the correction loss of >10° in the short-segment group whereas none exhibited this in the long-segment posterior fixation group demonstrating the superiority of long-segment fixation to maintain alignment. Li and Liu performed a meta-analysis comparing short-segment versus long-segment fixation for thoracolumbar burst fractures. Anterior body height loss, rates of implant failure, and Cobb angle were all lower in the long-segment group. In addition, despite the longer constructs, complication rates were not statistically significantly different between the groups. The downside, of course, is the additional levels fused in these cases. While some may believe kyphosis following thoracolumbar burst fractures is associated with poor outcomes, the literature does not support this. Mumford et al. published on 41 patients who were treated nonoperatively for burst fractures. Average kyphosis was nearly 30°; yet, there was no association with patient outcomes. Similarly, Cantor et al. demonstrated an average of 20° of kyphosis; yet, minimal pain in his cohort of 18 patients. Thus, while we may want to improve alignment for purposes of long-term sagittal balance, it may not be associated with better clinical outcomes. Nonetheless, with our increasing understanding of the importance of sagittal balance, surgeons should strongly consider the effect that significant kyphosis may have on upright posture especially in younger patients. Longer term follow-up on patients with significant residual kyphosis may demonstrate a decrease in patient reported outcomes. In the end, anterior reconstruction appears superior to short-segment posterior instrumentation; however, long-segment posterior fixation, short-segment posterior fixation along with the addition of fracture-level screws have shown improved perhaps similar ability to maintain alignment. We prefer an anterior approach in patients with high load-sharing scores yet, in whom we wish to preserve levels. Alternatively, short-segment fixation with fracture-levels screws or long-segment fixation with height restoration through ligamentotaxis in the neurologically intact patient is equally supported in the literature. For patients with a burst fracture presenting with a neurologic deficit, the goals of surgery include decompression of the neural elements as well as stabilization. Proponents of an anterior decompression argue that the anterior approach is ideal for visualization and decompression, as the majority of compression is secondary to retropulsed vertebral body which is easily accessible through this approach. 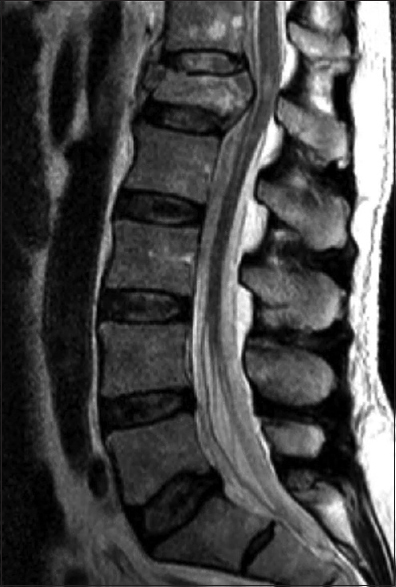 A survey of the members of the spine trauma study group reported that 91% of respondents favored an anterior approach in the setting of an incomplete neurologic injury with intact posterior ligamentous complex, and 82% supported a 360° decompression and fusion in an unstable burst fracture with posterior ligamentous complex (PLC) disruption, believing that posterior decompression through ligamentotaxis was inadequate. However, does the literature support these arguments? There is ample literature that an anterior approach provides excellent canal decompression and can lead to improved neurologic function. In looking at upper thoracic fractures (admittedly not thoracolumbar burst fractures), Bohlman et al. found that a subset of patients worsened or did not improve following laminectomy, and he concluded that a posterior approach with laminectomy was contraindicated for incomplete lesions. He thus recommended an anterior transthoracic decompression and fusion to provide the best chance of neurologic outcome. Kaneda et al. analyzed long-term outcomes in 150 patients who underwent anterior decompression and fusion for thoracolumbar burst fractures. At an average of 8 years postoperatively, the percentage of the canal occluded decreased from 47% to 2%. In addition, 95% of patients improved by at least one Frankel grade, and 72% of patients who had preoperative bladder dysfunction recovered completely. McDonough et al. performed a retrospective review of patients with thoracolumbar burst fractures who all underwent anterior corpectomy with plating. Of the 16 patients who presented with a neurologic deficit, all improved at least one Frankel grade, and 11 had a full neurologic recovery. More recently, Dai et al. performed anterior corpectomies and reconstruction with either iliac crest autograft or titanium mesh cage and demonstrated significant neurologic improvement in all patients. When directly comparing anterior versus posterior decompression/stabilization however, there is no clear benefit to one approach with regard to canal decompression and neurologic function. Esses et al. performed a prospective, randomized study of patients with acute thoracolumbar burst fractures. Forty patients underwent either posterior pedicle instrumentation or anterior decompression and instrumentation. Average preoperative canal occlusion was 44.5% in the posterior group and 58% in the anterior group, with postoperative occlusion statistically different with 16.5% in the posterior group but only 4% in the anterior group, thus demonstrating improved canal decompression from an anterior approach. Neurologic outcomes were similar. Of the 18 patients who underwent anterior decompression, 14 remained the same, three improved one grade, and one improved two grades. Similarly, of the 22 who underwent posterior surgery, 19 remained the same, and three improved one grade. On the other hand, Wood et al. compared neurologically intact patients with burst fractures treated with either an anterior or posterior approach and found no statistically significant difference with respect to canal decompression. Several studies have attempted to summarize the full body of literature to compare anterior and posterior approaches. Xu et al. performed a meta-analysis comparing anterior and posterior approaches for thoracolumbar burst fractures. They were able to combine the results from four studies recording neurologic outcomes and found no statistically significant difference between the two groups.,, Canal decompression was better in the anterior group. Zhu et al. performed a systematic review and found conflicting results. In their analysis, canal decompression was significantly better in the posterior group; however, they similarly found no difference with respect to neurologic function. In the end, no definitive conclusion can be drawn as to whether one approach is favorable to another with respect to either canal decompression or neurologic outcome. Even if one approach did prove to permit better canal decompression, there is a little evidence that it correlates with the neurologic outcome. Boerger et al. performed a review of the literature in 2000 and concluded that not only was the current body of literature of poor quality but also perhaps that there was no significant advantage of surgical over nonsurgical treatment with respect to neurologic recovery., Other studies have similarly shown that there is no conclusive association between the extent of canal occlusion and neurologic symptoms. While, we believe canal decompression is an important goal of surgery, especially in incomplete neurologic injuries, the data supporting this is tenuous. It is thus difficult to justify one surgical approach over another purely with respect to the neurologic outcome. Comparisons of complications and perioperative data are difficult due to the heterogeneity of the studies involved. Nonetheless, in analyzing the data, there appear to be mixed results. Both meta-analysis by Xu as well as the systematic review by Zhu fails to find any differences between the anterior and posterior approaches with respect to overall complications. However, it is important to recognize that both studies only chose papers that included comparison of anterior and posterior approaches and that contained sufficient homogeneity to be included for analysis. In a recent study by Lin et al. – excluded from the prior analysis – comparing anterior and posterior approaches in 64 patients, the authors note 27 cases of hemopneumothorax and 13 cases of abdominal distension/constipation in the anterior group. Both reviews by Zhu and Xu were able to calculate perioperative data. According to Zhu et al., the subgroup of burst fractures treated through a posterior approach had shorter operative times as well as less blood loss. Similar findings were present in the analysis by Xu. It was also noted that costs were higher in the anterior cohort. Interestingly, the review by Zhu contains a paper not present in the Xu review, which analyzes 94 patients undergoing three different approaches. In this study by Wu et al., the operative time for the anterior approach group was nearly double that of the traditional posterior approach group (176 vs. 94 min). The review by Lin et al. also demonstrated intraoperative blood loss, operative time, and pulmonary function was all superior in the posterior group. In patients undergoing combined anteriorposterior reconstruction, the perioperative data demonstrate significantly higher patient morbidity. Shin et al. retrospectively reviewed 46 patients who had been surgically treated for thoracolumbar burst fractures, 11 with a combined approach and 35 with a posterior approach. Not surprisingly, kyphosis correction was superior in the combined group (15° vs. 10° ). However, the mean surgical time was 305 min in the posterior group and 567 min in the combined group. In addition, the median blood loss was nearly 500 ml in the posterior group but over 1000 ml in the combined group. The German trauma association reported outcomes of 733 patients treated operatively for thoracolumbar burst fractures through either anterior, combined, or posterior approaches. No approach demonstrated superiority with respect to neurologic recovery. While the circumferential treatment group showed the best improvement in kyphosis, the posteriorly treated group demonstrated superior functional and subjective outcomes. 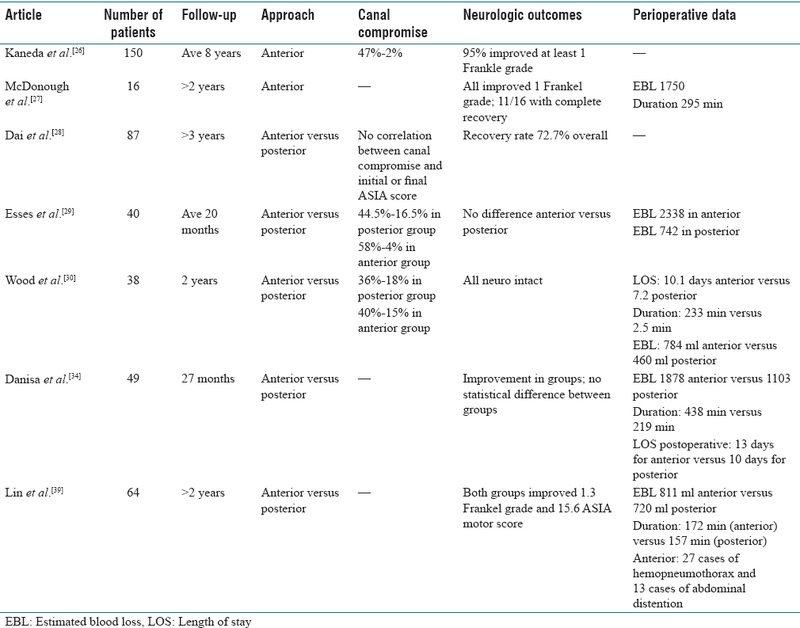 Regarding blood loss, operative time, and perioperative factors, a posterior approach is likely superior [Table 1]. This is a 33-year-old female who sustained a fall down several steps while intoxicated. She initially presented with back pain; however, she had the onset of lower extremity weakness and urinary retention after attempting ambulation. 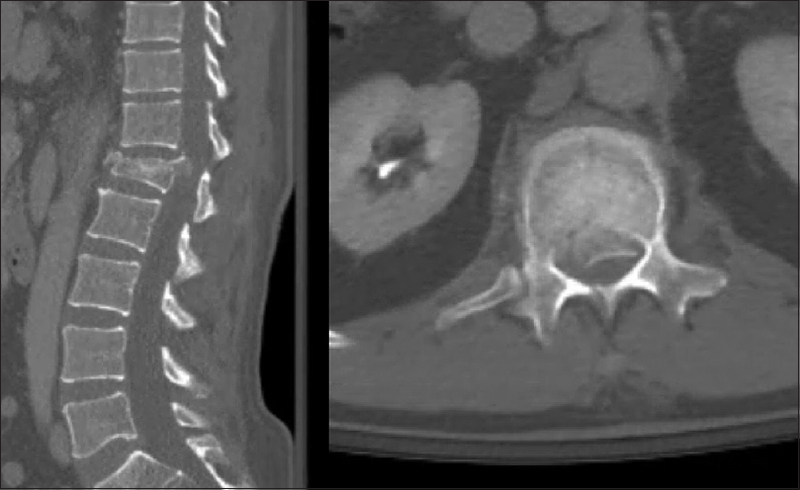 Radiographs, computed tomography (CT), and magnetic resonance imaging (MRI) demonstrated a T12 burst fracture with significant bony retropulsion but without PLC injury [Figure 1], [Figure 2], [Figure 3]. 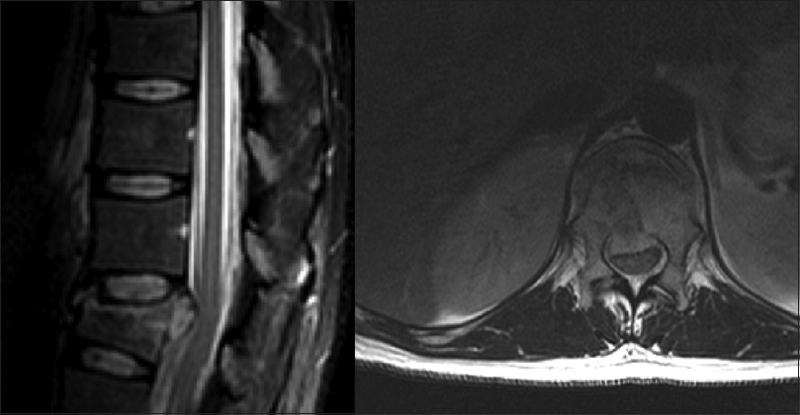 She was treated with anterior decompression and stabilization through a left-sided approach [Figure 4]. Postoperatively, she did well and recovered full neurologic function. This is a 40-year-old male construction worker who fell from scaffolding and sustained an L1 burst fracture with an incomplete neurologic injury [Figure 5]. Sagittal and axial CT scans demonstrated significant canal compromise [Figure 6]. An MRI demonstrated increased signal at the level of the conus [Figure 7]. The patient underwent a posterior decompression and stabilization with long-segment posterior fixation [Figure 8]. At the latest follow-up, he has normal bowel and bladder function and has regained the majority of his lower extremity strength. It is important to recognize that the quality of evidence for any particular surgical approach is low, despite the prevalence of thoracolumbar burst fractures and the abundance of literature discussing management options. While anterior approaches to the thoracolumbar spine for reconstruction and stabilization may have previously been the standard of care, the ubiquitous use of improved pedicle screw constructs has in many cases obviated the need for this approach. There is no absolute indication for anterior reconstruction supported by the current literature. The patients who undergo short-segment posterior fixation, especially with high load-sharing classification scores, probably benefit from anterior column support to maintain alignment and protect from hardware complications. Data also seems to support improved sagittal alignment when an anterior approach is performed especially as part of a circumferential fusion. This may come at the cost of increased complications and longer operative time. Many surgeons seem to support anterior decompression and stabilization for burst fractures with the incomplete neurologic injury without injury to the PLC and support circumferential decompression and fusion in cases of combined incomplete neurologic injury with posterior ligamentous injury. We also believe this approach is rational; however, we accept that no definitive evidence exists to show improved neurologic recovery with greater canal decompression which may occur with the anterior approach. Long-segment posterior fixation, while increasing the number of levels fused, may be sufficient to avoid an anterior reconstruction from a biomechanical perspective. In our practice, the utility of anterior reconstruction is well suited for patients in whom we wish to employ short-segment posterior fixation, yet have high-point scores by the load-sharing classification such as young patients in whom saving levels fused can provide long-term benefit. Alternatively, the patients who undergo a posterior approach but exhibit progressive kyphosis can later undergo salvage anterior column reconstruction. Otherwise, all posterior approaches through short-segment or long-segment fixation with canal decompression through ligamentotaxis in the neurologically intact patient appear to be equally supported in the literature. In those undergoing short-segment fixations by an all posterior approach, strong consideration should be given to placing screws in the affected level, as biomechanic and clinical studies support its ability to prevent kyphosis. The benefits of improved canal clearance with the anterior approach regarding neurologic improvement in the impaired patient are unclear at this time due to the paucity of high-quality evidence examining this issue. DeWald RL. Burst fractures of the thoracic and lumbar spine. Clin Orthop Relat Res 1984;189:150-61. Gertzbein SD. Scoliosis research society. Multicenter spine fracture study. Spine (Phila Pa 1976) 1992;17:528-40. Limb D, Shaw DL, Dickson RA. 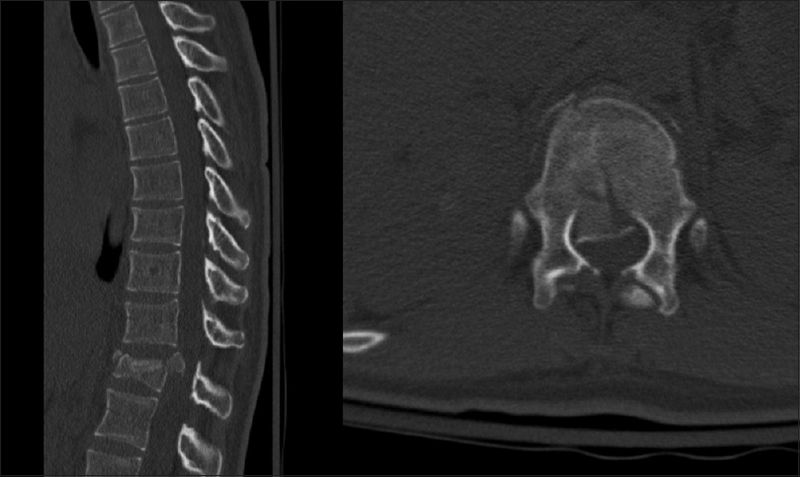 Neurological injury in thoracolumbar burst fractures. J Bone Joint Surg Br 1995;77:774-7. Vaccaro AR, Lehman RA Jr., Hurlbert RJ, Anderson PA, Harris M, Hedlund R, et al. A new classification of thoracolumbar injuries: The importance of injury morphology, the integrity of the posterior ligamentous complex, and neurologic status. Spine (Phila Pa 1976) 2005;30:2325-33. McKinley LM, Obenchain TG, Roth KR. Loss of Correction: Late Kyphosis in Short-Segment Pedicle Fixation in Cases of Posterior Transpedicular Decompression. Proceedings of the Sixth International Congress on Cotrel-Dubousset Instrumentation. Montpellier: Sauramps Medical; 1989. p. 37-9. Sasso RC, Cotler HB, Reuben JD. 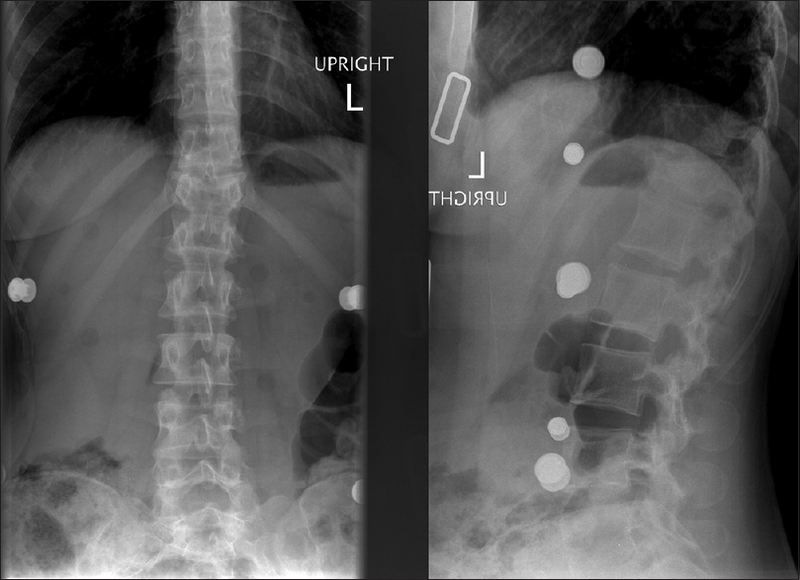 Posterior fixation of thoracic and lumbar spine fractures using DC plates and pedicle screws. Spine (Phila Pa 1976) 1991;16:S134-9. Stephens GC, Devito DP, McNamara MJ. Segmental fixation of lumbar burst fractures with Cotrel-Dubousset instrumentation. J Spinal Disord 1992;5:344-8. Ebelke DK, Asher MA, Neff JR, Kraker DP. Survivorship analysis of VSP spine instrumentation in the treatment of thoracolumbar and lumbar burst fractures. Spine (Phila Pa 1976) 1991;16:S428-32. Carl AL, Tromanhauser SG, Roger DJ. Pedicle screw instrumentation for thoracolumbar burst fractures and fracture-dislocations. Spine (Phila Pa 1976) 1992;17:S317-24. Kallemeier PM, Beaubien BP, Buttermann GR, Polga DJ, Wood KB.In vitro analysis of anterior and posterior fixation in an experimental unstable burst fracture model. J Spinal Disord Tech 2008;21:216-24. Parker JW, Lane JR, Karaikovic EE, Gaines RW. 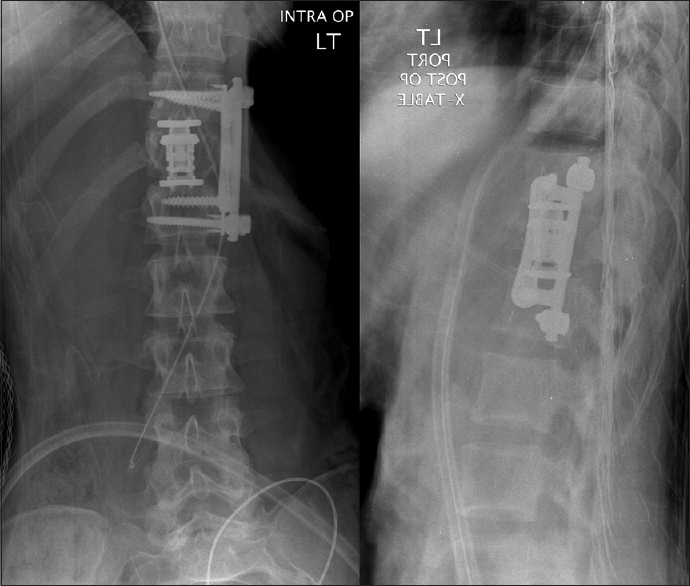 Successful short-segment instrumentation and fusion for thoracolumbar spine fractures: A consecutive 41/2-year series. Spine (Phila Pa 1976) 2000;25:1157-70. Been HD, Bouma GJ. Comparison of two types of surgery for thoraco-lumbar burst fractures: Combined anterior and posterior stabilisation vs. posterior instrumentation only. Acta Neurochir (Wien) 1999;141:349-57. Sasso RC, Renkens K, Hanson D, Reilly T, McGuire RA Jr., Best NM, et al. Unstable thoracolumbar burst fractures: Anterior-only versus short-segment posterior fixation. J Spinal Disord Tech 2006;19:242-8. Hitchon PW, Torner J, Eichholz KM, Beeler SN. Comparison of anterolateral and posterior approaches in the management of thoracolumbar burst fractures. J Neurosurg Spine 2006;5:117-25. Mahar A, Kim C, Wedemeyer M, Mitsunaga L, Odell T, Johnson B, et al. Short-segment fixation of lumbar burst fractures using pedicle fixation at the level of the fracture. Spine (Phila Pa 1976) 2007;32:1503-7. Guven O, Kocaoglu B, Bezer M, Aydin N, Nalbantoglu U. The use of screw at the fracture level in the treatment of thoracolumbar burst fractures. J Spinal Disord Tech 2009;22:417-21. Farrokhi MR, Razmkon A, Maghami Z, Nikoo Z. Inclusion of the fracture level in short segment fixation of thoracolumbar fractures. Eur Spine J 2010;19:1651-6. Jendrisak MD. Spontaneous abdominal aortic rupture from erosion by a lumbar spine fixation device: A case report. Surgery 1986;99:631-3. Tezeren G, Kuru I. Posterior fixation of thoracolumbar burst fracture: Short-segment pedicle fixation versus long-segment instrumentation. J Spinal Disord Tech 2005;18:485-8. Li J, Liu L. Comparison of short-segment versus long-segment fixation for the treatment of thoracolumbar burst fracture: A meta-analysis. Int J Clin Exp Med 2017;10:1750-62. Vaccaro AR, Lim MR, Hurlbert RJ, Lehman RA Jr., Harrop J, Fisher DC, et al. Surgical decision making for unstable thoracolumbar spine injuries: Results of a consensus panel review by the Spine Trauma Study Group. J Spinal Disord Tech 2006;19:1-10. Bohlman HH, Freehafer A, Dejak J. The results of treatment of acute injuries of the upper thoracic spine with paralysis. J Bone Joint Surg Am 1985;67:360-9. Kaneda K, Taneichi H, Abumi K, Hashimoto T, Satoh S, Fujiya M, et al. Anterior decompression and stabilization with the Kaneda device for thoracolumbar burst fractures associated with neurological deficits. J Bone Joint Surg Am 1997;79:69-83. McDonough PW, Davis R, Tribus C, Zdeblick TA. The management of acute thoracolumbar burst fractures with anterior corpectomy and Z-plate fixation. Spine (Phila Pa 1976) 2004;29:1901-8. Dai LY, Jiang LS, Jiang SD. Anterior-only stabilization using plating with bone structural autograft versus titanium mesh cages for two- or three-column thoracolumbar burst fractures: A prospective randomized study. Spine (Phila Pa 1976) 2009;34:1429-35. Esses SI, Botsford DJ, Kostuik JP. Evaluation of surgical treatment for burst fractures. Spine (Phila Pa 1976) 1990;15:667-73. Wood KB, Bohn D, Mehbod A. Anterior versus posterior treatment of stable thoracolumbar burst fractures without neurologic deficit: A prospective, randomized study. J Spinal Disord Tech 2005;18 Suppl:S15-23. Xu GJ, Li ZJ, Ma JX, Zhang T, Fu X, Ma XL, et al. Anterior versus posterior approach for treatment of thoracolumbar burst fractures: A meta-analysis. Eur Spine J 2013;22:2176-83. Danisa OA, Shaffrey CI, Jane JA, Whitehill R, Wang GJ, Szabo TA, et al. Surgical approaches for the correction of unstable thoracolumbar burst fractures: A retrospective analysis of treatment outcomes. J Neurosurg 1995;83:977-83. Zhu Q, Shi F, Cai W, Bai J, Fan J, Yang H. Comparison of anterior versus posterior approach in the treatment of thoracolumbar fractures: A systematic review. Int Surg 2015;100:1124-33. Boerger TO, Limb D, Dickson RA. Does ‘canal clearance’ affect neurological outcome after thoracolumbar burst fractures? J Bone Joint Surg Br 2000;82:629-35. Dai LY, Wang XY, Jiang LS. Neurologic recovery from thoracolumbar burst fractures: Is it predicted by the amount of initial canal encroachment and kyphotic deformity? Surg Neurol 2007;67:232-7. Lin B, Chen ZW, Guo ZM, Liu H, Yi ZK. Anterior approach versus posterior approach with subtotal corpectomy, decompression, and reconstruction of spine in the treatment of thoracolumbar burst fractures: A prospective randomized controlled study. J Spinal Disord Tech 2011 [Epub ahead of print]. Wu H, Fu C, Yu W, Wang J. The options of the three different surgical approaches for the treatment of Denis type A and B thoracolumbar burst fracture. Eur J Orthop Surg Traumatol 2014;24:29-35. Shin JK, Goh TS, Son SM, Lee JS. Treatment of thoracolumbar and lumbar unstable burst fractures by using combined and posterior surgery. J Trauma Inj 2016;29:14-21. Reinhold M, Knop C, Beisse R, Audigé L, Kandziora F, Pizanis A, et al. Operative treatment of 733 patients with acute thoracolumbar spinal injuries: Comprehensive results from the second, prospective, internet-based multicenter study of the spine study group of the German association of trauma surgery. Eur Spine J 2010;19:1657-76.